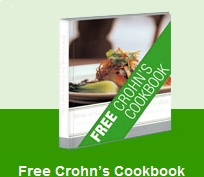 Sign up for your free Crohn's cookbook. This cookbook has been specially written for people living with Crohn's. It's full of easy-to-prepare recipes. And it's yours with their compliments. These recipes are healthy for everyone, even if you don’t have Crohn’s.